Nendoroid Petit Ikoku Meiro no Croisee set is nothing new, so let’s skip it. Nendoroid Plus charms from the upcoming PSP game Nendoroid Generation are being displayed there, revealing new characters compared to last month’s article – is that Millhiore F. Biscotti there? 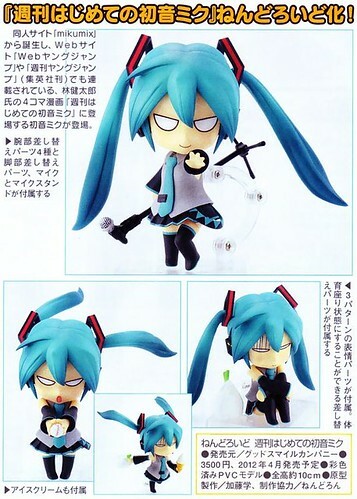 XD Anyway, the whole set of charms are included in the limited edition of Nendoroid Generation, priced at 10480 Yen and scheduled to be released on February 23, 2012. 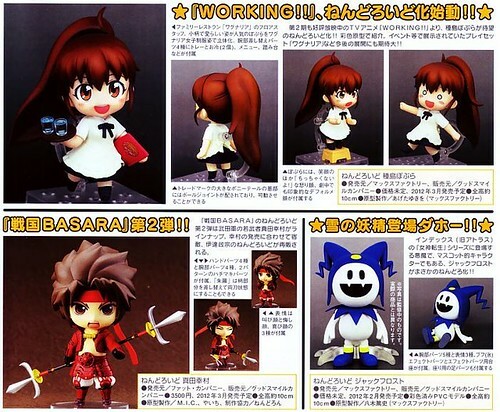 This entry was posted in News and tagged jack frost, magazine scan, max factory, nendoroid, nengene, persona, phat company, shin megami tensei, taneshima popura. Popura! Can’t wait will surely get multiples of her. That pony tail hair will make for fun switches! That charm Steins Gate Kurisu is such a tease, come on GSC! Go ahead an make some petit Steins Gate nendos please! I am pretty sure that we will hear more news shortly. it’s funny that she got a “bangku” to make her stand higher! hahahah!! but it’s making me confused… will this nendoroid be shorter than any nendoroids?